NiQ Health would like to congratulate their 2013 Partner of the Year, ELA. 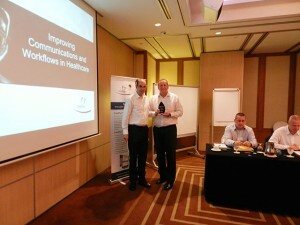 This was announced at NiQ Health’s 2013 Annual Partner Conference in Singapore. NiQ Health CEO Andrew Rothon presented the trophy and prize to ELA’s GM Todd Emery. Western Australian distributor ELA was recognised for their sales contribution and for connecting the first CarePlus™ Mobile Connect installation internationally. 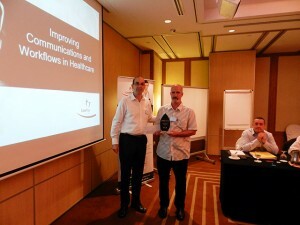 CarePlus™ Queensland distributor HCS was also recognised for the Most Outstanding Contribution of 2013 because of their high level of growth. NiQ Health would like to thank their partners internationally for their continued support and in particular those who attended the 5th Annual Partner Conference.